Can the Rangers win a home Game 4? Derek Stepan checks a Canadien in Game 3. He is one of a handful of key Rangers who must step it up if the team is to win a home Game 4 tonight. AP Photo via Getty Images courtesy NYRangers. I’ll start this off with a simple question for our team. Following Sunday’s atrocious performance as they let the Canadiens dictate play in an easy 3-1 road win at a quiet MSG, can the Rangers win a home Game 4 to tie the series up? It’s not easily answered. Not when this team featuring plenty of core guys still around from 2015 have experienced six consecutive home defeats in the NHL playoffs. The count is now 21-4. Frankly, I’m tired of talking about it. Is it psychological? It sure seems that way. When asked about the losing streak that the Lightning started in Game 2 of a disappointing Eastern Conference Final, J.T. Miller wouldn’t discuss it. Who wants to? But if they can’t get fully prepared for Tuesday’s game, it could be another short postseason. The Canadiens deserve credit for how they’ve played. They’ve showed more urgency in rallying to come back in Game 2 and then taking away the Rangers’ speed in Game 3 to take a 2-1 lead in the best-of-seven first round series. It’s the Habs who are standing up at the blue line forcing stubborn Blueshirts into neutral zone turnovers fueling their strong counter attack. They are the better defensive team getting sticks on passes and shots when they’re attempted. A problem that plagues Alain Vigneault’s team, who made it way too easy on Carey Price. Montreal didn’t make it easy on Henrik Lundqvist, who had to deal with 10 shots in the first period despite two Rangers power plays which did the usual. Zilch. How can the coaching staff and players explain a miserable six shots? No wonder MSG has become the worst home ice advantage in the league. Most of the True Blue fans have been replaced by impostors who aren’t as enthusiastic about the team. This is what you get with the outrageous prices James Dolan charges. They didn’t even give out t-shirts. The question is this. With Vigneault making changes to his four lines, will the new combinations work? It looks like rookie Pavel Buchnevich could draw in for Tanner Glass on a line that had success very early with Mika Zibanejad and Chris Kreider. The gifted 21-year old Russian also practiced on the first power play unit. If he plays, can that awaken Zibanejad and Kreider? What about moving rookie Jimmy Vesey up to play with Derek Stepan and Rick Nash? Like Buchnevich with Zibanejad and Kreider, Vesey had some early success with Stepan and Nash. That means Vigneault has added key playmaker Mats Zuccarello to a third line of Kevin Hayes and Miller. A combo which could work. If anything, it could provide more balance. Michael Grabner is slated to move down to a fourth line with Oscar Lindberg and Jesper Fast. If Glass comes out, it’s not for anything bad. He played as well as any Rangers forward which should tell you everything. When the 12th forward has more goals than Stepan, Kreider, Zibanejad, Hayes and Miller, there is clearly something wrong. Either the top players step up or they’ll be facing a 3-1 series deficit at the House of Horrors Thursday. I’d be remiss if I didn’t mention the disappointing first three games for top defenseman Ryan McDonagh. Sure. He and Dan Girardi draw the tough assignment. But McDonagh is without a goal or assist. A far cry from the impact he had in 2014. He also isn’t getting enough ice-time. If you take out Game 2 which went to overtime, McDonagh isn’t being ridden enough by Vigneault. With the state of the defense fragile, McDonagh and Brady Skjei should be utilized more. Not less. They are the best skating D who can fuel the transition game Vigneault prefers. Brendan Smith is the third best defenseman. But somehow, he was back with Skjei on the third pair in practice. Nick Holden is expected to return to the lineup. That means more of the chaotic Holden/Marc Staal pair. A pair which should be limited at even strength. There needs to be better management on the bench. The question is this. If the Habs continue to take away the stretch pass and stand up, will the Rangers make the necessary adjustments. We’ve seen them fail miserably against Tampa Bay in Games 5 and 7 of 2015. We saw them get dominated by a much faster and superior team in the Penguins, who exposed their weaknesses. The Canadiens aren’t Pittsburgh. They are not a high scoring team. They do it with grit and hustle. That’s the Claude Julien way. If you watch the other series, you see teams scoring goals by having players in front. The Maple Leafs lead the Capitals 2-1 winning the last two games in sudden death. They aren’t doing it by not getting dirty. They have plenty of young talent which helps. Auston Matthews, William Nylander and Mitch Marner are not easily stopped. But when you see vets such as James van Riemsdyk and Game 3 hero Tyler Bozak doing the dirty work, it rubs off. That is also why the Predators are on the verge of knocking off the Blackhawks. They dominated overtime after a pair of Filip Forsberg goals in the third period rallied them at home. It was a relentless forecheck with players continuing to make life difficult for Corey Crawford that eventually resulted in a Hawks turnover and Kevin Fiala’s overtime winner which put them up a commanding 3-0. They took the action to Chicago. A veteran team that looks overmatched. Even Jonathan Toews has looked out of sorts against the Preds’ aggressive attack. What it demonstrates is that the teams who win at this time of year must do whatever it takes. So, if that means more chips and recoveries in the corner like they did to win Game 1, so be it. The Blueshirts must get back to that mentality. They can’t have 21 giveaways and expect a different result. They need to manage the puck better and not play into Montreal’s hands. Game 4 is at 7 PM later tonight. The Garden will be waiting for something positive to happen. If they’re flat like Sunday or unprepared, they won’t win. They have to come out flying and skating with purpose. It’s their livelihood at stake. They don’t want to go back to Montreal facing elimination in a Game 5 on the road for a second consecutive Spring. There are plenty of questions that remain unanswered. As Lundqvist echoed the other night, it’s up to the 20 players to give everything. It’s up to them. 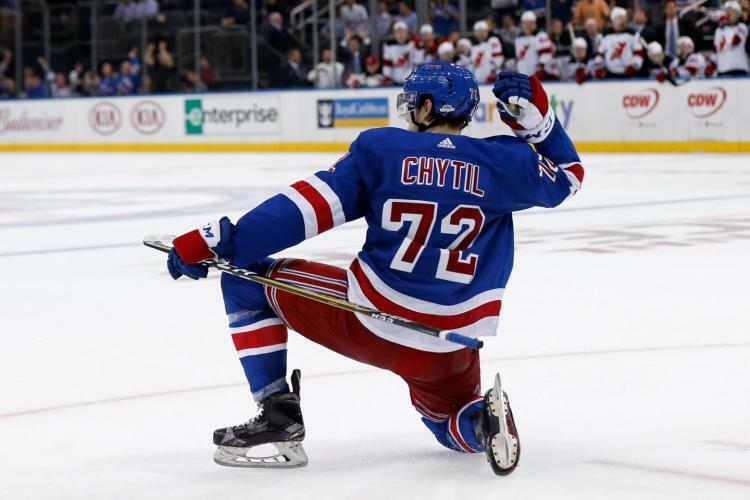 This entry was posted in Column, NHL Playoffs, NYRangers and tagged Alain Vigneault, Brady Skjei, Canadiens, Chris Kreider, Column, Derek Stepan, Henrik Lundqvist, J.T. Miller, Kevin Hayes, Mats Zuccarello, Mika Zibanejad, Montreal, NYRangers, Pavel Buchnevich, Rangers, Ryan McDonagh. Bookmark the permalink.